Pianist and City alumna Clare Hammond has won the Young Artist category at the Royal Philharmonic Society (RPS) Music Awards. The awards, which are the highest recognition for live classical music in the UK, celebrate outstanding achievement during the previous year and are presented in association with BBC Radio 3. 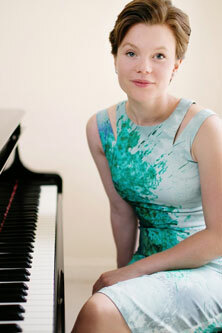 Clare completed her Doctorate of Musical Arts in the Department of Music in 2012 and in recent years has built a reputation as a virtuoso musician and an advocate of imaginative concert programmes. Soon after receiving the RPS award, Clare released her third recording with BIS Records, Horae (pro clara), which was given a four-star review in the Guardian. She also recently appeared in the film The Lady in the Van alongside Dame Maggie Smith, and recorded music for the production’s soundtrack. In October, she will curate three concerts for the BBC at the Belfast International Arts Festival, to be broadcast as part of the BBC Radio 3 Lunchtime Concerts Series. Clare will then make her Royal Festival Hall debut with the Philharmonia in December. Dr Miguel Mera, Head of the Department of Music, said: "I am delighted that Clare Hammond has been acknowledged for her commitment to piano repertoire of the 20th and 21st centuries. She is a fantastically energetic and engaging performer."